I’m so excited that Terri-Grothe has been nominated for the Liebster Award! 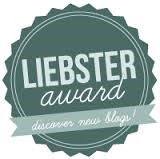 It is said that the Liebster award was created to recognize and/or discover new bloggers and welcome them to the blogosphere. In the digital world of the internet, this seems like a nice gesture, in my opinion! 1. Acknowledge and link back your nominator–that’s me. 2. Answer 11 questions given by the nominator. 3. Nominate other bloggers who have less than 200 followers. 4. Think of 11 new questions to ask your nominees. To my nominees, here are your list of 11 questions that you must answer! 1) Where do you get the ideas for your blog posts? 2) An idea that changed your life? 3) If you could meet anyone dead or alive, who would it be? 4) What are your fav things to blog about?